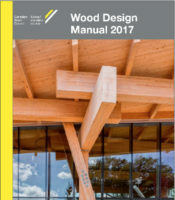 The 2017 Wood Design Manual is a two-volume publication that includes CLT and NLT design guidance and a copy of the CSA O86-14 (Updates 1 and 2). The Wood Design Manual has a similar scope to the “Concrete Design Handbook” and the “Handbook for Steel Construction”, providing practitioners with essential information for the design of structural wood components following a Part 4 engineered design approach. Use this essential wood design publication in conjunction with the National Building Code 2015. 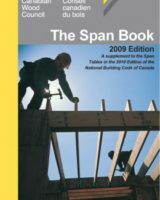 No carpenter would head for the job site without a hammer, and no designer should begin specifying wood floor or roof members without a copy of the Span Book. 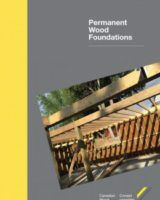 Permanent Wood Foundations (PWF) brings together all of the standards and building practices used to build these types of foundations. The 2016 edition has been updated to conform to the requirements of CSA S406-16, CSA O86-14 and NBC 2015. Introduction to Wood Design has been prepared to facilitate and encourage the instruction of wood engineering at Canadian universities and colleges. 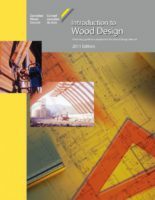 The publication is a supplement to the Wood Design Manual 2010. 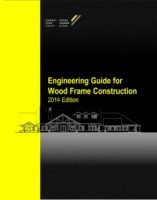 The Engineering Guide for Wood Frame Construction provides guidance to engineers, building designers, building officials, builders, and students of these disciplines, on the structural design of wood elements and connections for wood frame buildings that fall within the scope of Part 9 of the NBC. The 2014 Edition of the Guide was revised in order to conform to changes in the 2015 edition of the NBC.